...the powers that be developed an incurable case of Lexus envy. When people bought a Lexus back then, they didn't say they owned an ES250, an ES300 or an LS400. They simply said, "I drive a Lexus." While the allure of saying, "I drive a Legend", or "I drive an Integra" is not lost by enthusiasts like us. The upwardly mobile professionals of the Clinton Era often liked to say the brand before the name. They all flow better when they roll of your tongue than, "I drive an ACK-kew-ra." Acura gradually destroyed the social equity of their popular all-star lineup.. First by renaming the Legend the RL and then by neglecting it for nearly 20 years. The NSX died the demographic dance of death as did most sports and luxury coupes of the 1990's. Only a chosen few, like the NSX, spilled over into the Y2K era with a last gasp of minor face-lifts and ever-so-slight performance upgrades. This is the Acura story that every enthusiast hears in varying forms at one point or another. Legend, Integra, NSX were great. Acura's current line-up "Zzzzzzz!!!!" But that's not the truth — at all. If you squint really hard at this graph, or click here, you'll find two surprises. The first is that when it comes to vehicles traded-in with over 180,000 miles — Honda is ranked 1st out of 38. And Acura is barely ahead of Lexus and Toyota at #2. This triumph over Lexus and Toyota can't be explained by Acura's mechanical reliability. While Acura has some impressive performers, not a single Lexus model has a greater chance than 1 in 19 of having an engine or transmission issue. Matt Farah's Million Mile Lexus may be an aberration. But it's based on superb engineering from chrome grille to tailgate. Does Acura even remotely compete with this consistent level of quality? No! Nein! Nyet! Acura was exposed to an even greater proportion of downright lousy transmissions than Honda from 1998 thru 2003. While only V6 Accords with automatics and Honda Odysseys received these slipping, leaking, gear chomping shifters of death, the majority of Acura's line-up was not so lucky. Eric The Car Guy pretty much nails what professional car buyers think whenever they see a Y2K era Acura TL, CL, and MDX go through the auction block. One final note on Honda/Acura transmissions concerns the V6 transmissions from '99 to '03. I'll be honest; these transmissions had a very high failure rate. It doesn't matter how you maintain them, it seems they are doomed to fail. If you're considering one of these vehicles, have it checked out to see if the transmission had been replaced in the past, and even then be skeptical. I was putting in two and sometimes three of these transmissions a day for a while. That should tell you something about their reliability. Nick Lariviere has highlighted the severity of this issue on each clickable graph to the left. The black baseline for each year is the industry average for transmission issues. The industry average in 1999, for example was just over 10%. For Acura, this defect rate is nearly 30%. Keep in mind this is after a transmission recall was already issued. 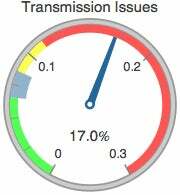 Audi, the brand we highlighted yesterday, has nowhere near the level of transmission defects than Acura during the same time period. Although the time period from 1995 thru 1997 is far worse than average. And BMW, a brand that tends to get some flak for expensive and complex repair issues, has transmissions that typically far outperform Acura. If you click here, you'll find that nearly every BMW model except the 745i has a reasonable to low defect rate. So why are nearly one in four Acuras in this study kept for the long haul if so many have pretty nasty transmission issues and, arguably, not as much prestige as most other luxury brands? Fewer decontenting issues than the competition. And designs that have remained contemporary without being too dated for a mainstream audience. There is one regrettable exception to that Acura rule, but it represents less than 10% of Acura's overall sales in North America. The Acura RL, the Avalon of the Acura line. It may be more boring and conservative than a 1600 page paper from the Heritage Foundation, but it still has a nice interior that ages well. 7th. 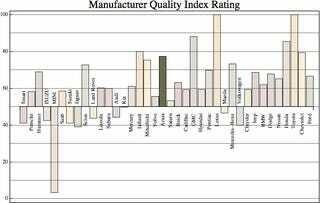 Feel free to click the graph, and you will find that Infiniti, GMC, Chevrolet, Honda, Toyota, and Lexus are all ranked higher overall. GM's full-sized trucks and SUVs help GMC and Chevy move into the upper echelon while Acura, thanks to one lousy transmission that never quite got sorted out, pulls Acura down to a less than Legendary ranking.